In December 2016, Dan, Three Rings’ Head of Development reflected on what he gets from volunteering with Three Rings, and what’s kept him doing it since 2002. Dan came up with the idea for Three Rings while volunteering at Aberystwyth Nightline. For many of the organisations that use Three Rings, it’s hard to imagine – or even remember – what life was like beforehand, but not for me! I’m Dan, and I’ve been involved with Three Rings since the very beginning, back in the early 2000s. 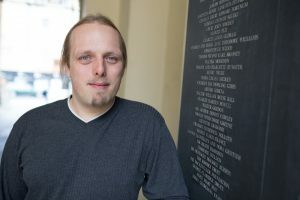 In the early days it was just me, which is part of why I still to this day do a little bit of many different activities within Three Rings, but my primary role is as the Head of Development: leading the team that produces code that makes our software grow better and better. 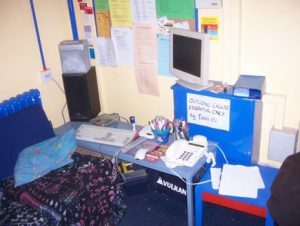 When I began volunteering at Aberystwyth Nightline in 1999, they – like virtually every volunteer-run helplines at that time – used pens and paper to keep track of who their volunteers were and what shifts each was doing. The ‘volunteer database’ was a stack of index cards in a plastic box, and the ‘rota system’ was a diary with hand-drawn lines, filled with volunteer names… often crossed out and replaced with other names. Signing up for a shift – which required physically travelling to the office, or else phoning the person on duty – was a necessary chore, but an even harder job was taking responsibility for finding volunteers to fill ‘gaps’ in the rota: this was a time when many people did not yet carry a mobile phone (some of our volunteers had pagers, though – do you remember those? ), so you’d find yourself remembering the times that volunteers were likely to be at home so you could catch them on their landlines! In 2000, while on duty and between calls, I spoke to the other volunteer on duty with me. “Why is it that we’re still using pens and paper to run our rota?” I asked, squinting to read the name written on a particular shift, squeezed into the tiny space left after a larger name had been crossed-out, “Surely we could computerise it… maybe even put it on the Internet, so that volunteers who have computers could sign up from anywhere!” But my fellow volunteer pointed out the obvious flaw in my idea: at that point, Aberystwyth Nightline didn’t have a computer of its own! Many of our volunteers didn’t have computers either, so it’d be essential that volunteers could, at least, access the rota from the office, even if they couldn’t from anywhere else. Aberystwyth Nightline’s first computer didn’t really have anywhere to live, so it was just propped up in the corner. That changed in 2002 when a friend of the organisation donated a computer to Aberystwyth Nightline. 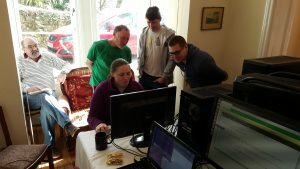 That, at last – combined with the increasing number of volunteers who owned a computer of their own – provided the necessary infrastructure for my project to begin! I put together the most-basic of prototypes over the course of a couple of weekends, called it Three Rings after the duration that Aberystwyth Nightline would allow the telephone to ring before answering it, and showed it off to the committee. They were excited with the possibility and adopted it immediately, but I had no idea at that point how widely the idea would spread. One by one, other university Nightlines adopted Three Rings, and I listened to their suggestions for future features and began to expand it. Most of those features still exist, in some form or another, although some – such as support for WAP, an early version of mobile Internet that never really caught on – fell by the wayside. Meanwhile, the volunteer I’d been on duty with when I’d first come up with the idea joined me, writing documentation and helping other Nightlines get their accounts set up. Three Rings looked very different in its early days! In around 2006, I found myself volunteering with Samaritans, and there – while helping to roll out Samaritans’ email-listening service – a fellow volunteer asked me how we’d used to run our rotas when I was a Nightline volunteer: I showed him Three Rings, and he was fascinated: could it be used by Samaritans branches, too? Somehow, I’d not until that point considered that Three Rings might be useful to other organisations besides Nightlines. There were a number of enhancements that needed to be added before it was ready to be used by Samaritans, so I recruited a handful of extra volunteers and we got to work. We formed a company (now known as Three Rings CIC), overhauled the software to make it fit for a more-modern Web, and started bringing Samaritans branches on board. Since then, we’ve expanded and are now used by community libraries, museums, helplines, homeless shelters, community shops, animal charities… even emergency blood transport teams! My role has changed, too: early on, and especially for the years that it was pretty much ‘just me’, I necessarily did some of everything: writing code, helping users, authoring documentation, organising future plans, and so on. But as Three Rings grew, I was able to let go of many of the tasks in order to focus on the bits that interest me the most. These days, my primary role is running the development team – a diverse mix of about half a dozen developers who write code to add new features to Three Rings (and, occasionally, to fix any bugs that turn up). I also sit on the Board, overseeing the strategic direction of our organisation… and on the Support Team, helping the rest of the team handle any queries from users that are of a more-technical nature… and on Beverley‘s Welcome team, helping charities get set up with Three Rings for the first time, which I particularly enjoy because I get to speak to so many people passionate about using volunteers to do good in the world. So I suppose that I still wear a fair number of hats, even though my focus has shifted towards development. What I love most about volunteering for Three Rings is that I’m able to help support so many volunteers doing so much great work. I spent around 12 years volunteering on various helplines, and once in a while I’d really feel like I’d helped somebody achieve something life-altering… but at Three Rings, I’m helping tens of thousands of people every day to go out and help other people. For a project that started based on an idea I casually mentioned sixteen years ago, that’s an enormous thing and I’ve felt hugely privileged to see how it’s grown and become a part of so many people’s lives. I also really enjoy the fact that I get to volunteer alongside some really fantastic and friendly people. Three Rings supports a little under 28,000 volunteers but our own core team is much smaller, all made up of passionate people supporting the project from different backgrounds: virtually all of us have volunteered somewhere that benefits from Three Rings, but we each have our own experiences to bring to the table. Volunteering with Three Rings has strengthened old friendships and created new ones. Oh, and within the development team: I’m also really happy that I get to play with some of my favourite technologies while I’m in the process of producing software that supports hundreds of charities. As a software engineer who in my paid work often has to work with technologies that are less-enjoyable, it’s nice to come home and spend a little while producing beautiful things with Ruby, Rails, and Coffeescript. Perhaps because I’ve been involved for so long, people have sometimes said that they don’t know what Three Rings would do without me. But from my perspective: I don’t know what I’d do without Three Rings. Of all the places I’ve volunteered, I’ve never had an experience that felt so satisfying and so meaningful, nor so full of opportunities for personal growth. If you’d like to volunteer with Three Rings, whether as part of my development team or in any other role, I’d love to tell you more about how rewarding it is. Get in touch with us, and maybe I’ll get to do just that. Inspired? For more information about volunteering with Three Rings, take a look at our Volunteering Page!